September | From the Seasonally Occupied Territories . . .
September looms large in the year-round Vineyarder’s calendar. A popular 1990s bumper sticker read PRAY FOR SEPT.! and in small print underneath: M.V. Year-Rounders Trying to Deal with Summer. September, we like to say, is when we get our island back. 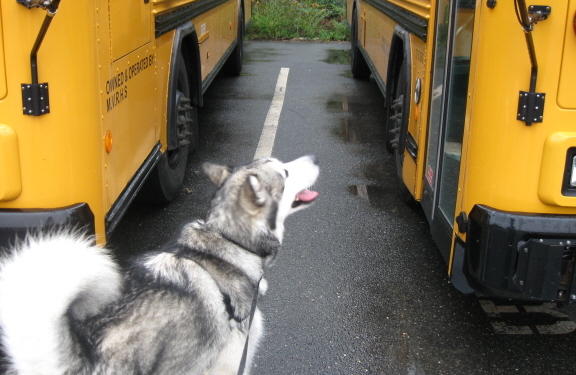 According to the calendar September arrived almost a week ago, but September isn’t really here till the school buses return to the back parking lot at the West Tisbury School. As Trav and I headed homeward on this morning’s misty-moisty walk, there they were. Only four of them, not the whole complement, but the yellow-orange glow was evident through the trees from several hundred feet away. September is here at last. Teachers and students were nowhere in evidence all summer, but there’s been activity a-plenty at the school. Trav and I have monitored it on our walks. 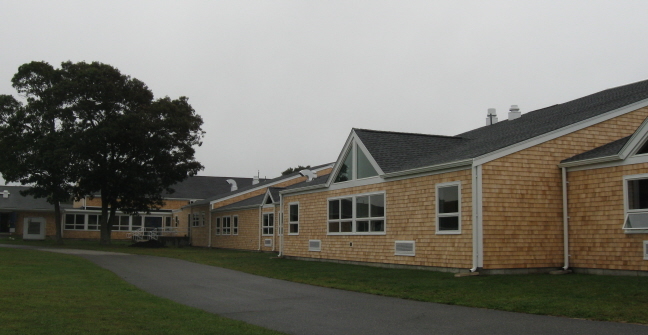 The whole sprawling building has been reshingled, and many of the windows have been replaced. 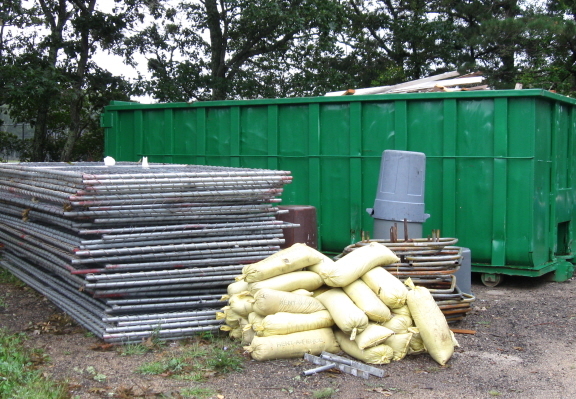 The back parking lot has been given over to storage units, dumpsters, and vehicles involved in the refurbishing. A chain-link gate blocked vehicle access to the lot. By Sunday morning the gate had been dismantled. Could the buses be far behind? This morning some of the buses were back, and the front parking lots were jammed with the cars of teachers readying their rooms for tomorrow’s first day of school. Probably the kids haven’t been praying for September as fervently as their parents, especially the ones who’ve been juggling summer work schedules while trying to keep an eye on their offspring. Here is where being part of an extended family can make a big difference. By 15, many Vineyard young people have full- or part-time summer jobs. Over the summer, when Trav and I went walking after sundown, no lights shone through the trees. The school might not have been there at all. That’s about to change, I expect. 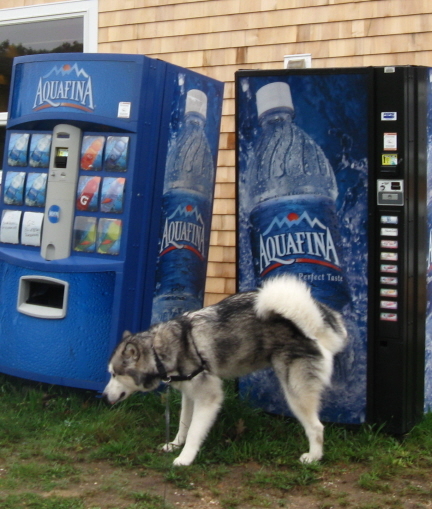 At the nearer end of the school’s backside are two Aquafina bottled-water-dispensing machines. When they’re operating, the bright blue-white glare is visible from at least a quarter mile away. The town must have told the school to make sure the light wasn’t visible from Old County Road, but it doesn’t seem to have made any stipulation about visibility from the woods. 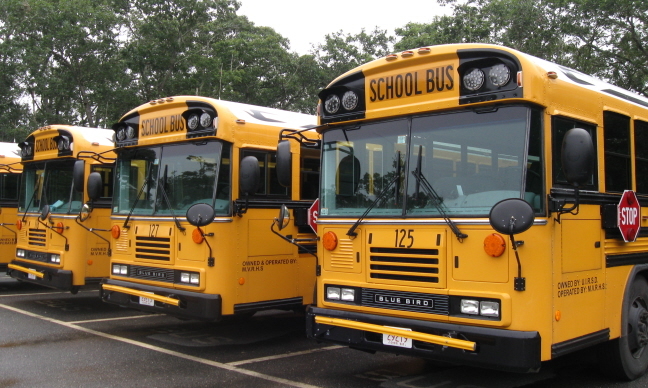 This entry was posted in Martha's Vineyard, tourism and tagged bottled water, September, Travvy, West Tisbury School. Bookmark the permalink. I love your photos Susanna. Do more. I love my little digital point-and-shoot!